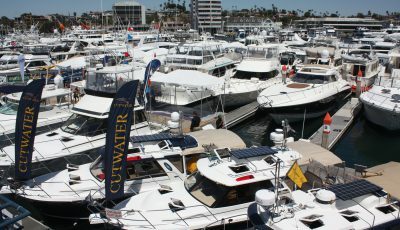 As I have mentioned in my recent columns, September is a busy month for all things boating in and out of Newport Harbor. Every year around this time one of the most impressive races occurs from our jetty area to Avalon. Some of the most physically superior men and women race their outrigger canoes across the ocean to Avalon. These crews practice for months to ensure their stamina will last for 26-miles. Saturday morning we were making bait at the West jetty for a fishing trip off the East end of Catalina and noticed an armada of boats grouped together a half mile Southwest. As we have been a chase boat years ago on the family sport fisher “Que Pasó,” we’re familiar with the weekend event. 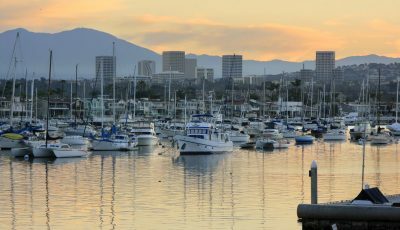 The ladies race over to Catalina on Saturday and the men race back on Sunday. Saturday evening allowed all the teams, friends and family to catch up with each other around a bonfire…oops, please don’t let the bureaucrats about this or they’ll issue air citations. It’s a fascinating process as every twenty minutes, two members of the crew bale out into the ocean and two have been dropped off a chase boat ahead of the canoes and muscle their way back into the canoe. This process allows a twenty minute break each hour so the six to seven hour trip is physically managed. Normally one of the Newport teams wins this event. 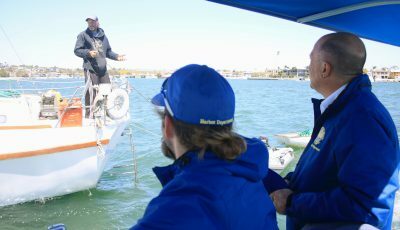 Whether it be sailing, rowing, off-shore power boat racing, fishing or anything on the water, Newport Harbor boaters are the elites of the world. This weekend is the premier fishing event out of the almost 100-year old Balboa Angling Club. The Masters Tournament takes place and the best of the best will be participating. If memory serves me, (and sometimes it fails me), you have to be invited to participate and normally your fishing record will need to include past tournament wins. Last Saturday the water temperature meter on “Sundance” showed 71.6. When the water is this warm all of the exotic species can be in play. Research indicated for our trip last weekend that within 100-miles off Newport there were Dorado, yellow fin tuna, blue fin tuna, marlin, swordfish, a 500-pound mako shark boated 5-miles East of Avalon, yellowtail and white bass. What a choice!